The Tibetan Plateau, the highest and largest plateau in the world, is well known as 'The Third Pole'. Tibet has also been called 'Asia's water tower' because so many of Asia's major rivers such as the Ganges, Indus, Tsangpo/Brahmaputra, Mekong, Yellow and Yangse rivers originate there. Despite its importance, the uplift history of the plateau and the mechanisms underpinning its evolution are still unclear, largely because reliable measurements of past surface elevation are hard to obtain. Plant fossils might seem an unlikely way of determining surface height and thus what is happening deep in the Earth to build mountains and plateaus. However, because plants live at the Earth's surface and have to constantly interact with the atmosphere, their leaves are very good at recording their surroundings, including properties of the atmosphere that are related to height. This approach has shown that the rise of the Himalaya was a relatively recent phenomenon, and took place after parts of Tibet were already above 4.5 km. However, well-dated plant fossils are rare in Tibet. Recently, a large collection of plant fossils was made from the Lawula Formation in the Markam Basin in SE Tibet. This collection was made by Tao Su and his colleagues from Xishuangbanna Tropical Botanical Garden, Chinese Academy of Sciences. Remarkably, the fossils were preserved between volcanic ash layers that allowed them to be precisely dated using 40Ar/39Ar analysis. It turned out that the fossil assemblages were much older than their relatively modern appearance would suggest. Tao Su and his colleagues recorded several thousand fossil leaves from four different layers, but two layers have the richest plant fossils with the best preservation. The lower layer (MK3) was deposited 34.6 million years (Ma) ago and the upper layer (MK1) at 33.4 Ma. As such they spanned the Eocene-Oligocene Transition (33.9 Ma), a time when deep sea sediments show significant cooling. Interestingly, layer MK3 is dominated by leaves of the ring-cupped oak and members of the birch family, whereas MK1 consists almost exclusively of alpine taxa with small leaves. Assemblage composition and leaf form show clearly a transition from evergreen and deciduous broad-leaved mixed forest to alpine shrub. That climate change was quantified by Climate-Leaf Analysis Multivariate Program (CLAMP), a proxy that uses leaf form to estimate a range of climate variables such as temperature and moisture, as well as surface height, in the geological past. Using this approach, Tao Su and colleagues showed that at the E-O transition southeastern Tibet was ~3 km high and actively rising to close its present height. Their results demonstrate clearly the early onset of uplift in this region, rather than uplift beginning some 10 million years later near the start of the Miocene. 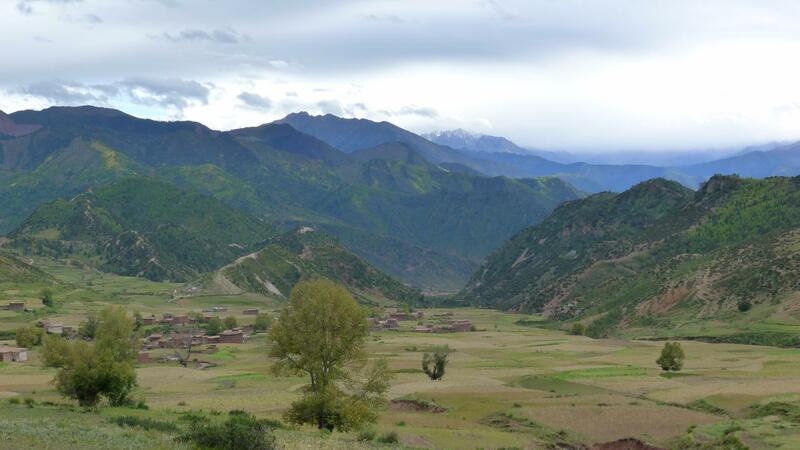 The results show that the elevation of southeastern Tibet took place largely in the Eocene, which has major implications for uplift mechanisms, landscape development and biotic evolution. Furthermore, 40Ar/39Ar analysis of the volcanic ashes bounding the Markam fossil floras adds to a growing list of Paleogene sites in southeastern Tibet and Yunnan, which are far older than previously thought based on biostratigraphy and lithostratigraphy. It is already clear that the evolution of the modern highly diverse Asian biota is a Paleogene, not a Neogene, phenomenon and took place before the E-O transition. This implies a modernisation deeply-rooted in the Paleogene, possibly driven by a combination of complex Tibetan topography and climate change. The Xishuangbanna group are continuing to collect spectacular plant fossils in different parts of the Tibetan Plateau. In the coming years, it would expect to see a revolution in the understanding of Tibetan uplift and its relationship to climate and biotic evolution in Asia. <p>Uplift, Climate and Biotic Changes at the Eocene-Oligocene Transition in Southeast Tibet.